Why every solopreneur should be using slack. True story: Last week, I took a couple hours away from the office for a haircut and highlight. (I knew it was time when a girlfriend told me at The Savvy Experience that she LOVED my ombre. Thanks girl, but that’s just my roots growing in unchecked.) When I left the salon, I looked at my phone and had 46 notifications from Slack. Believe it or not, this lit me up. Because, while I don’t use Slack to communicate with the other members of Team Magnoliahouse, it’s a deeply important and joyful part of my day. 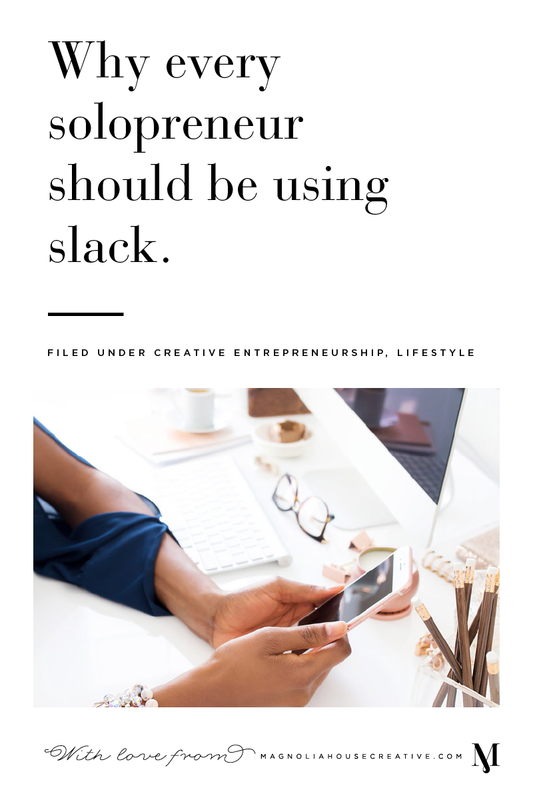 Instead, I use Slack to stay connected with both my business besties and mastermind sisters. It’s our virtual water cooler, a place where each of us, spread across the country in our lonely offices can find the community, support and accountability we crave (oh, and it’s a great place to share clips from Silicon Valley, like my absolutely favorite one about scrum). So here’s my challenge to you: reach out to your other entrepreneur or work from home friends, and invite them to join you on Slack. You don’t have to know them super well, and it’s ok if it’s a little awkward at first. Be sure to download the desktop app (trust me on this one, it’s way better than browser). And then, just engage. Have fun. Laugh at each other and lift each other up. Being a solopreneur doesn’t mean you have to miss out on the joy of coworkers. ← My Insane System for Scheduling Months of Pinterest Content at a Time.